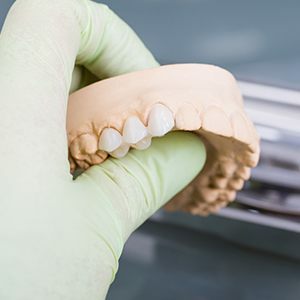 If you're self-conscious about cracked, broken, decayed, or worn teeth, we can bring back your healthy, natural-looking smile with dental crowns, sometimes called caps. A crown can return structure, strength, and function to a tooth with extensive decay or damage. Designed to fit snugly and function as a healthy tooth, a crown will protect your tooth from further damage and preserve the jaw's correct natural alignment. We use precious metal, porcelain pressed (or fused) to metal and all-porcelain crowns. To maintain a fully white smile, we recommend all-porcelain crowns. Our precise color-matching system enables us to find the right shade of porcelain to blend with your natural tooth color. Porcelain crowns are also extremely durable and long-lasting, and these benefits make them popular with dentists as well as patients. Typically, we can design, fit, and place your crown in just a couple of short appointments. Once a crown is placed, you can care for it just like a natural tooth. Conscientious brushing twice a day and daily flossing will protect the base of your crown from bacterial growth. Be sure to see us at least two times each year for professional cleanings and a preventive exam, too.